I am excited to share some amazing news, which I have been keeping a secret for a few months. 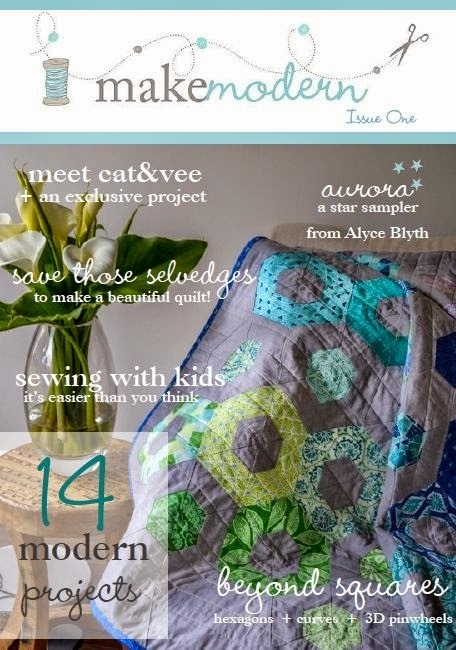 I’ve always been good at keeping confidences, so I am very excited to finally share with you a new, bi-monthly, quilting e-zine, Make Modern, from Australia. Everything in this e-zine is fresh, crisp and relevant. But this blog post is not about me. It’s about the e-zine and everyone, including the three editors, Jane Kelly, Kristy Lea, and Lara Motta, who worked so hard to make this happen. It takes a dedicated team of people to create an amazing publication. The premier issue is full of creative quilting and home decorating patterns, informative articles, projects, resources, technology, and stunning photographs. Read the about page on the Make Modern web site, because you may just see yourself in the text of that page, as I did. To see and sample the preview issue go to Issuu. At the bottom of this post there are links about how to subscribe. As many of us know, quilt math can be pretty tricky. Alyce Blyth clearly explains and shows us with examples, how to use it successfully in, “Upsize, Downsize, Resize Any Quilt Block.” No more fuss or frustrating computations that cause complicated equations that end up resembling algorithms. Instagram has always been a bit puzzling for me. I keep thinking; Why do I need it? Why do I want it? Do I need to post to IG and facebook? However, “Instagram for Quilters: A What, Why and How Guide,” by Kristy Lea gave me a way to experience it differently; think about it more as a fun and enjoyable social media option. By not experiencing it as another “must do item” I need to check off my “to do” list every time I post to my blog, the stress factor is gone. Creative thoughts are beginning to come my way. And maybe, or not, in a few months I will have figured out a way to integrate it with my blog. In the meantime, I’m just having fun with it. On another note, any publication that includes an article about relevant technology in my field always grabs my attention and gratitude. How many times have I machine quilted in the ditch, and had a hard time keeping my stitches in that ditch? The number is far greater than my age, I can tell you that! Melissa Gottliebsen wrote an outstanding article, “Straight Lines; Introduction to Straight Line Quilting.” There are other, and possibly better ways to achieve the “stitch in the ditch,” look and feel, without having to “stitch in the ditch.” I can’t wait to try her method. The creativity in this article awesome. A fellow blogger from The New Bloggers Blog Hop, from the Spring – Summer, 2014, Jo King, shares with readers her cat, and her pattern for “Memory Cats,” which grew out of a QAL she participated in, using Elizabeth Hartman’s pattern. Extremely cute. Make Modern includes a few give-a-ways, and ends with a library, which includes some of the best modern quilting books published. And there is some information about what’s coming in the next issue too. Overall Make Modern has it all – 112 pages of what Jane describes in our mini-interview below, and some. Take a go at it! Anne: Congratulations on the debut of Make Modern. Tell us how the e-zine came about. Jane: Make Modern was born when Kristy (Lea), and I (we are in a real-life quilt group together), were lamenting the lack of modern quilting publications in Australia. The few locally-produced quilting magazines here are very steeped in tradition, so we saw a gap in the market. With my background in craft magazine publishing and Kristy’s experience in blogging, pattern writing and design, and our involvement in the social media side of quilting, we realised we were as good a candidates as any to bring a modern quilting publication to fruition. We roped in one of our business-minded quilting besties, Lara (Motta), and the Make Modern team was born. Anne: What is the mission of this new modern e-magazine? Jane: Our goal is to raise the profile of modern quilting in Australia, and to provide a quality source of fresh, modern patterns each month. We also have lots of features each issue so it is more than just patterns. There is a lot of very cool stuff happening in the modern quilting world and we want to bring a bit of that to our readers. We also have a fair bit of practical information, because everyone wants to become better quilters. The few locally-produced quilting magazines here are very steeped in tradition, so we saw a gap in the market and plan to fill it. Anne: Describe what the content will be like. Jane: Of course, social media and the online community is such a huge aspect of modern quilting that the magazine’s content will be international, to reflect the community. But we really want to do what we can to build the modern quilting community in Australia. It is very much about community for us and hopefully readers will feel like the magazine is their magazine, they can share their ideas with us, they can connect and contribute via social media etc. We want to work with our contributors to help them grow their crafting businesses/blogs etc too. So far, we have had a fantastic response to our concept, with so many people telling us how excited they are about the magazine. Given the first issue isn’t even available until next week, (beginning of September), that’s very reassuring and shows us that our gut feeling about the gap in the market was correct. Launching any new quilting endeavor begins with a great blog hop, doesn’t it? And I am more than honored to be a part of this list. Please visit the blogs of these very talented quilters and contributors. The blog hop started when I was traveling abroad, and the technology wasn’t cooperating with me at all. I hope you check out the blogs of these very creative quilters, many of whom we all know, or have heard of. I am honored, and feel so lucky to be among them. It takes a strong team with dedication and “a fire in the belly,” type of effort and attitude to produce an e-zine that’s this good. This is how you can purchase a copy or subscription, or go to the Make Modern home page where you can shop and subscribe to the newsletter for the blog.